At ITSPmagazine, we aim to make a difference in the community and society as a whole. We try to do this in many ways, and through our media partnership with Independent Security Evaluators, we have yet another opportunity to achieve this goal. 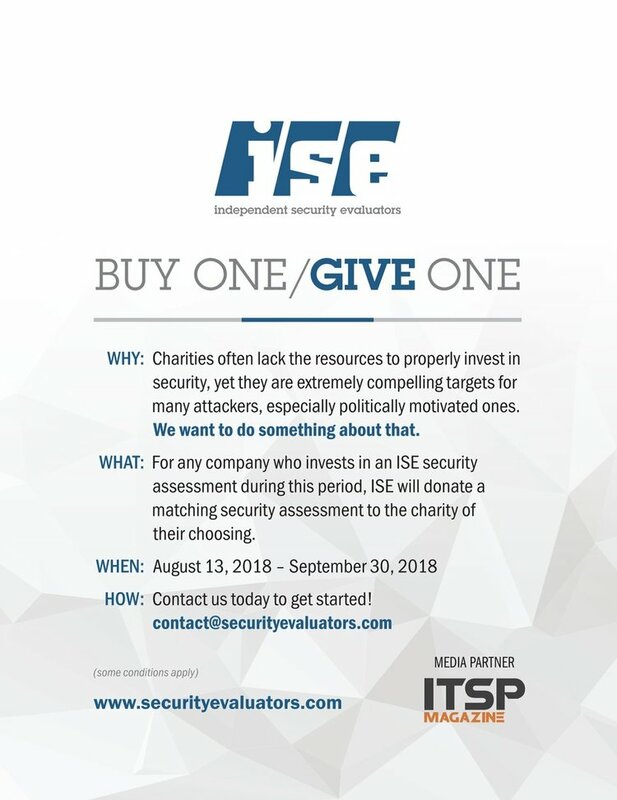 ITSPmagazine is extremely proud to support the "Buy One / Give One" charitable program that ISE is offering and we hope that our partnership will further raise the cybersecurity awareness bar for these organizations. If you are interested in being part of this movement we invite you to listen in to learn more. BALTIMORE, Aug. 7, 2018 /PRNewswire/ -- Independent Security Evaluators (ISE) announced a new initiative focused on charitable giving, known as "Buy One / Give One." During the initiative, when a company invests in a security assessment or consulting engagement with ISE, ISE will donate a matching service to a charity of the customer's choosing. "Think of this as 'Tom's for Security'," says Ted Harrington, Executive Partner of ISE, referring to the famous giving pledge by global shoe manufacturer Tom's, in which every purchase of a pair of shoes is matched by Tom's donating a pair to those in need. According to the organizers at ISE, the purpose of the campaign is to support organizations that provide societal good, but who might not have the resources to adequately invest in security. "Charities rightly allocate as much of their funding as possible to the causes they exist to support, thereby leaving only minimal resources for operational overhead, including security," elaborates Harrington. "Yet, charities are enticing targets for a variety of attacker types. We wanted to do something about that." The campaign was first announced by media partner ITSPmagazine. "Cyber safety in society shouldn't be limited to those with huge budgets and the expertise to implement a program," says Marco Ciappelli, Co-founder and Creative Director of ITSPmagazine. "When Ted mentioned the Buy One / Give One campaign to us, we knew we wanted to partner with ISE to be part of making a difference." ISE and ITSPmagazine will be promoting the campaign during Black Hat and DEF CON in Las Vegas, as well as for the remainder of the campaign, which runs August 13, 2018 through September 30, 2018. Some conditions apply. "We aim to provide our niche specialty of security assessments in a way that delivers value in multiple ways, impacting multiple entities in the towns and cities we live in," explains Harrington. The enterprise that pays for the original assessment benefits from an improved security posture. The purchasing enterprise gets to support a cause they care about by giving an assessment to a charity of their choice. The charity that receives the elite service also gains an improved security posture for which they otherwise might not be aware of or are unable to justify an investment in. "The value then comes back to our own people at ISE as our team gets to use their talents altruistically to help great organizations do meaningful work," says Harrington. Enterprises can get involved by procuring security assessments for their own organization, and then designating which charitable entity to donate the matching service to. Charities and non-profits can get involved by working with their board members, the organizers, and the broader community to encourage enterprises to select them as recipients for the donation match. Founded in 2005 out of the PhD program at the Johns Hopkins'Information Security Institute, ISE is a security consulting firm comprised of hackers, computer scientists, reverse engineers, and cryptographers who help companies defend against sophisticated adversaries through manual, white box security assessments. ISE is widely recognized as being the first company to hack the iPhone. Visit ISE in the ITSPmagazine company directory. Founded in 2015 by Sean Martin, CISSP, and Marco Ciappelli, ITSPmagazine is an online publication that focuses on information technology, cybersecurity and data privacy, and the influence that it has on our everyday life. Our select team of editors, journalists and industry professionals focuses not just on technology and cybersecurity, but on the impact that they have on our individual lives and society – and, for a change, vice versa.